← Writing for an authentic audience, being real. Thanks Isobelle Carmody. It disturbs me that we are not seriously thinking about the future of school libraries. This statement will receive incensed objections; teacher librarians are, after all, talking about changes in what we do and how we do it at conferences and in their own libraries. We talk about some of these changes in my own school library – delivering ebooks, providing transferable skills such as critical literacies to our students, delivering online resources. Well shoot me down if I upset you but I still think we’re not getting it. We can’t make changes to our libraries and continue to hold onto the way we’ve always done it. I seriously think we’ll be out of a job soon unless we move along with public libraries and transform what we’re doing. We need to look at future predictions for education and the world of work, let go of what we’re comfortable with and make serious and fast-moving plans for change. I don’t know about you but I can’t stop thinking about this topic. I don’t plan to retire for a long time (God willing) and don’t like to see myself made redundant. I’m also enamoured with my job and its possibilities, its enormous range of roles, its creative and connective nature, its freedom from the daily grind of curriculum and assessment of exhausted and time-poor teachers, its focus on school community, the empowerment of essential skills teaching, its embracing of transformative technologies. I could go on. Just this morning I asked Jenny Luca on Twitter what she would be speaking about at the SLAQ2012 conference. She said she hoped ‘to talk about the future of the profession – what we need to do to ensure there is one’. I look forward to following her talk online because I know Jenny understands the imperative nature of this topic and will be worth listening to. Also this morning I found on Twitter (via Judy O’Connell) a link to this article from Northwest England: ‘Special report: The future of public libraries; what the senior managers think’. I can see in many ways that school libraries (at least the ones in Melbourne, Australia) are lagging behind public libraries in their unwillingness to move with the times. New, shiny, colourful spaces – lovely, but that’s not fixing the problem. I found myself thinking that many of the points made in this article applied equally to school libraries. (You can read notes summarising the meeting here or listen the 60 minute recording. What are the core services of libraries now and in ten year’s time? To provide unbiased access to info. No longer transactional [that is, not based on stamping out books] but moving to transformational [presumably, this means, improving people’s life chances]. (Oh yes! Some school libraries have got this but at my school we are still spending most of our time stamping books and putting print credit on our boys’ printing accounts! How can we move into a transformational role? Something we should be discussing. I’m going to tread onto dangerous ground and even suggest that we avoid freeing ourselves up from the desk because provides us with the busy work our school community is used to observing. If we freed ourselves up we’d be challenged to organise engagement with teachers and students). Libraries will increasingly work with communities, where “anything can happen”. Libraries will be very different “two miles down the road”. Volunteers can deliver more so “every neighbourhood is different” and every library will be different. We need to employ people who positively react to community and allow libraries to be places which “people can recognise as their own space”. (I wonder if our school community views our library as their space or our space? Certainly our students treat our library as they would their lounge room – noisy but vibrant. How can we do the same for teachers? I know that Kevin Whitney (Head of Library at Kew High School) does this by providing a quick, friendly service, a ‘yes, we can do that for you’ manner and a cup of coffee and CD playlist. Public libraries will need to engage more with e-books and encourage “live” literature such as author visits which are really important. [However, it seemed like all the participants, with the possible exception of Ciara Eastell of Devon, did not really have their heart in this one and saw the delivery of books as, well, tedious and somewhat old-fashioned. This was summed up by one panel member who said “we’re going to get savvier than offering just books”. Of course school libraries focus on reading for enjoyment and literacy which is central to education. There’s so much more we can do (and are doing in many cases). Reading is not just decoding the writing and that’s why we offer audio and ebooks. But it’s also about many others things such as the thinking, discussion and debates that come out of it. Why not provide regular activities which focus on these things? Some of these things are happening in our libraries and others outside the library. Let’s become event organisers and creators for these things so that we’re not just limiting ourselves to author talks (fantastic as these are). We could do these things in different ways. I haven’t yet skyped an author but I plan to. I have brought authors into our yr 9 English student blogs, and students are thrilled that authors are commenting on their posts and sharing ideas. I’m hoping to organise a Slam Poetry event at the school – outside the library and hope to include teachers from different curricular areas to sit on the judging panel. What are you doing? What would you do if you had more courage? Are there any limit to what libraries can do? I really like the idea of surprises. I have a plan for a surprise which I can’t share in case it’s not going to be realised. If I had my way, our library would overcome its financial limitations by decorating ‘grunge’ or be a kind of Wunderkammer. What I’ve seen in beautifully refurbished and designed school libraries is fantastic but it’s more a reflection of what librarians want and how they perceive their space than what students want. I say we listen to our students and include popular culture in our designing of spaces. And this brings me to my final, and most dangerous, paragraph. This is where I lose friends (I hope not!) I’ve observed a defensiveness in our profession. One which occasionally divides teacher librarians and technicians into class distinctions; which sometimes sees us frustrated when we understand more about important literacies than teachers do but are unable to get a foot into classrooms to make any difference; which sees us taking up our precious class time cramming what our professional journals have told us we should be doing – unaware that nobody sees the value in this, unaware that the teacher really only wanted a quick 15 minute talk. Sometimes we don’t listen enough to the teachers, don’t have enough patience to build trust in the relationship before we go for it. Sometimes we don’t ask students if they already know something, or ask them what they really need help with, because we are determined to ‘do’ our planned information literacy lesson. If this isn’t you, then I apologize but I know I’ve been in all these situations at some stage and I’m never going to be there again. Our separation from the rest of the teachers and from ‘owning’ classes of students is difficult, and we have to work hard to build these relationships, because we know that relationships need to be forged before we can successfully teach our skills. I believe these relationships have to be sincere, real, not just as a way of promoting ourselves, and teachers can see through the marketing approach. 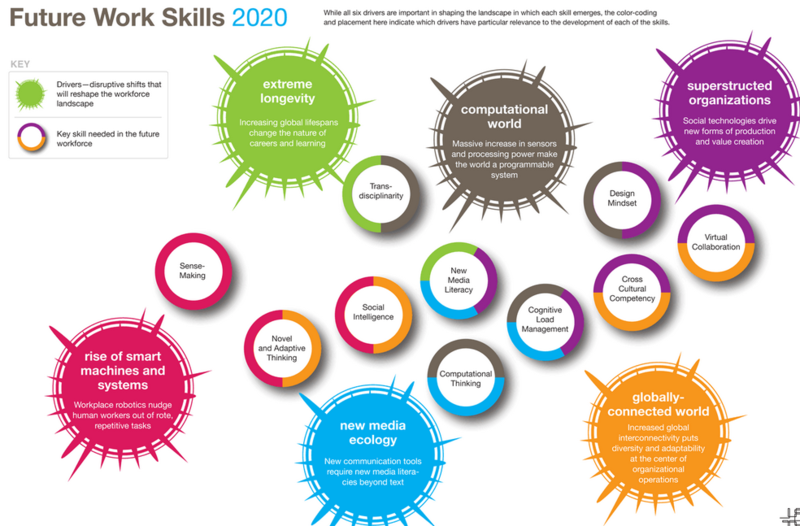 The Institute For The Future (USA) has published its Future Work Skills 2020 report. If you look at the summary below, you get an idea about what we should be thinking about in terms of our own future for school libraries. You’ll have to view the original version to be able to read this. There’s so much here we could be helping the school community to realise: novel and adaptive thinking, new media literacies, transdisciplinarity, cross cultural competencies – we have the potential to play a role in all of these. We should take note of the ‘rise of smart machines’ prediction and free ourselves from the repetitive work which stops us from getting out and doing more essential things. We can do so much for social media competencies across the school so that the whole school focus is on a globally connected world. Just take a look at the Optus Future of Work Report 2012-2016 and its appeal for flexible workspaces. Futurist speaker, Tom Frey, lists teachers as one of the jobs which he predicts will disappear by 2030. But coaches and course designers will stay, according to the report. Believe these reports or not, we should be looking at the future; things can’t stay the way they have been. We have been lulled into thinking that education will not be subject to the changes which take place in business because it actually hasn’t changed for such a long time! But this disconnect will not last too long, and we need the mindset and understanding to move with the changes. We should be part of schools which educate students for their future world; let’s look outside the walls of our libraries and our schools, and start moving. 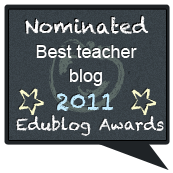 (I am a secondary school teacher librarian and speak from this perspective. Views expressed are my own and do not represent those of my school). It is hard to change libraries at schools when some teacher librarians are not up for change or can see the digital technology, innovation and library focus need to alter. As an E-Learning Facilitator/Teacher, I have made numerous attempts to motivate, lead and initiate change at my school, but to NO avail. It scares them! Love your blog on this topic. Will be forwarding it to those who will hear. I think it’s across the board in schools – teachers and teacher librarians tend to be happy with where they are, what they’re doing. Principals too. How many are looking at future predictions – things are happening fast, we can’t ignore it all forever. Thanks for dropping by to comment. Great post Tania and it is good to see many TLs leading the way in changing both the perceptions and practices of their school libraries. We have an opportunity to change some of our space due to an upcoming division of our physical collection once a new Junior School building is completed at the end of next term. Your post has reminded me to consult the community, in particular the students as to how they would see the freed space being repurposed. Small space, but a chance to maximise the opportunity. Carmel, I spoke out of a frustration that school libraries are moving too slowly but, as you say, it is teacher librarians who lead the way for changes across the school. The percentage of TLs modeling these changes is high considering our numbers compared with teachers. I do think we are not sure that we can break out of traditional library-based activities; we think we should be delivering the information literacy and digital literacies – all the serious stuff – and it is important, but public libraries are having so much fun with community events. (This is not so much a reply to your comment as a supplement to my post). I can see many beautiful school libraries and most of them are private schools. That’s why I’m advocating a creative approach in government schools. If you can’t do designer, then be clever and innovative. I would be interested to hear what feedback you receive from your students about the spaces. We want what’s best for our students but I wonder what the outcome would be if we brought the students into the planning. Should be interesting…. Thanks for your thoughts, Carmel. Thanks Scott. I remember reading one of those 2 articles. All good points. Some of the profession is doing so much, and should be extremely valued but, like teachers, others are doing things well without checking if they are what’s essential. We need to look ahead. Thank you for sharing the articles. So many good things in this article, Scott. Thanks for sharing. Just wanted to add that my post in no way states that teacher librarians are doing nothing. They are doing plenty. I just don’t think we are stretching our possibilities enough. TLs ‘get it’ about the future of education, I just think they aren’t transforming the face of the library quickly enough. I understand the frustrations of being change agent in schools with difficulty in moving teachers and principals. And I’m speaking about secondary school libraries – primary TLs are doing it tough, seeing classes back to back, running the whole show often on their own or almost. I enjoyed these ideas and can appreciate the frustration of teacher librarians. Part of the challenge is to revise how we interact with one another. As a teacher at my school, I am aware that it is common for some teachers never to pass near the library in the course of a day given its geographic situation on the College site. Our librarians are somewhat trapped in their own building and if staff don’t come in and out, then chatting, informal exchange of ideas and the notion of a learning hub never really develops. I like the idea of involving students more as well. Annette, this is the sad truth about schools and school libraries. Our library is out of the way, not an entry point, and I’m thinking about how we can make it a place teachers come to for relaxation and conversation. I’m not sure how this will work! I think the e-books movement is something that is unavoidable for pretty much everyone involved in education or library studies. I am a pre-service teacher in my second year. I have seen the change occur within the last two years even. I have pretty much moved away from reading physical books all together and I have mixed feelings about this. Part of me loves going to a library and finding books that interest me that way, but another part of me likes the convenience of looking titles up online and reading them on my ipad. It will be interesting to see how libraries adapt in the near future. Thanks for your comment, Andrew. I think most people will agree that, although e-books are easy to access and carry around, the browsing of and holding onto physical books is a joy. I love book shops and libraries. The thing is, our lovely archival non-fiction section in the school library remains virtually untouched. Should we keep buying these books? What about reference. Britannica has stopped publishing hardcopy books, for example. Like it or not, things are changing. I think we can’t afford the luxury of what we prefer, we need to look at the bigger picture. I guess most young people are like you and sensibly try out what works best. Sometimes it’s a little of everything. Great post, many teachers genuinely need switched on teacher librarians to lead the way. Maybe all teachers don’t want to change. Teacher Librarians who have the vision need to collaborate with those teachers in their school that can visualize the future. You’re right, Greg, we need to work with those who are switched on to what we want to do. Still, a principal at the top would be an asset.